Here’s my ex-rubber bumper 1500 Spridget club-racer. 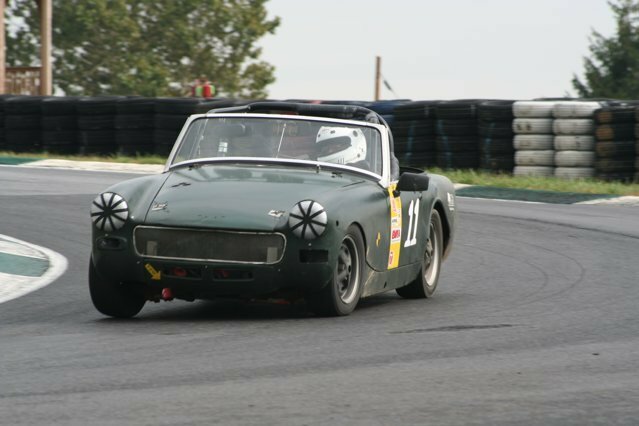 I had a 1275 Sprite that I raced in the 70s at Bridgehamton, but that one is long-gone. I’ve been racing this one for six years and have run it in 50+ wheel-to-wheel races (including several 3 and 4 Hour enduros). I’ve also run the car in the Pittsburgh Vintage Grand Prix at BeaveRun (twice) and the Hershey Vintage Hillclimb. The engine is almost entirely stock and probably pushes 70 HP on a really good day. It has stock, skinny steel wheels, an open diff, stock trans, etc. We’re taking it to the New Hampshire Vintage in three weeks and for 2008, we also plan to run the PVGP, the Mosport Vintage, the VRG Watkins Glen Vintage plus other stuff. The car ain’t quick but it’s very reliable and easy to drive. And a lot of fun.